Don’t let sweaty hair ruin your appearance for life after the gym or in the heat! Get the spray that takes your sweaty hair away! Unlike dry shampoos that are meant for dry, oily hair, Gym Hair is the only naturally derived cleansing solution designed for sweaty, wet hair. It’s easy to use. Shake the bottle before applying, section your hair and spray two or three times. Use your fingertips to massage throughout your scalp and hair. While you might want to keep the entire bottle to yourself, don’t forget about the sweaty hair of your active children. Gym Hair’s natural cleansing properties are safe for them too. Gym Hair is the perfect solution for busy mothers who want to go to the gym but still be able to run errands and look presentable after, or for working professionals who have to schedule their workout time around meetings and a hectic day at the office. It’s not just post-gym use either. Gym Hair is great for anytime you sweat. Take it to your children’s outdoor games, the beach, weddings, the pool or use after working on outdoor projects. 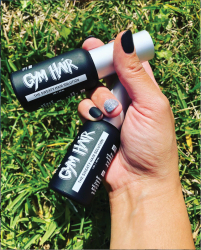 Gym Hair is available for purchase in a single bottle or as a two pack.